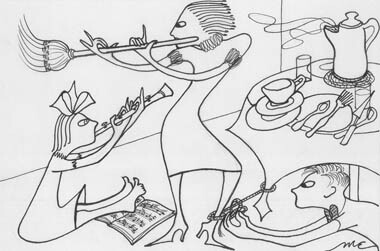 I have just added several pen and ink drawings to my digital archiving site The Artworks of Mary E. Hutchinson at http://meh.omeka.net. Hutchinson made these drawings between 1942 and 1945 depicting her topsy turvy daily life as she and Ruth Layton cared for the children of a close friend who appears to have been suffering from severe depression and may have been institutionalized. To view all of these drawings posted so far, click here and then select “Browse Items” from the top menu. Then click “Browse By Tag,” and finally select “pen & ink” from the tag cloud. Tell me about your experience navigating my Hutchinson site by leaving a reply here. I have a picture of a mans face done in pen and ink that is signed under it with Hutchinson 1928 ,could this be her work ? 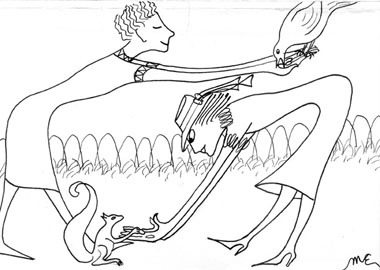 You are currently reading Pen & Ink Drawings Posted on Mary E. Hutchinson Site at Jae Turner.